HBO is moving forward with its Westworld adaptation and did so in odd, fantastic fashion in the form of a very strange, yet incredibly intriguing promo video. HBO announced the series launch via Twitter, with a creepy Vine (see below) confirming the 2015 air date. The original plot revolves around life-like robots that help amusement park guests fulfill their fantasies, but cause havoc when the park’s central computer fails and the robots run rampant. We will probably be doing a lot of speculating about this show. There seems to be an image of something resembling the Vitruvian Man, as well as the above shot of one person standing over another. The most intriguing aspect of the video is what sounds like Anthony Hopkins stating: “So Our Creatures Have Been Misbehaving”, possibly alluding to the notion of the robots as sentient beings. The tagline alone leaves us pondering what the premise and tone of the show will be: “Westworld is a dark odyssey about the dawn of artificial consciousness and the future of sin,” jeez. Under the tutelage of J.J. Abrams and Jonathan Nolan, we know it will try to dive deeper into humanity’s psyche and questions of the organic and artificial. The series, which is based on Michael Crichton’s 1973 film of the same name, will center on an adult amusement park that is filled with lifelike robots. The show’s androids — played by cast members including James Marsden, Evan Rachel Wood and Thandie Newton — can be killed off and return with completely different personas, allowing actors to play many characters. This premise has helped the HBO series attract a star-studded cast, which also includes: Anthony Hopkins, Ed Harris, Jeffrey Wright, Miranda Otto, and Rodrigo Santoro. In addition to the promo video, HBO also released the first official photo from the set. 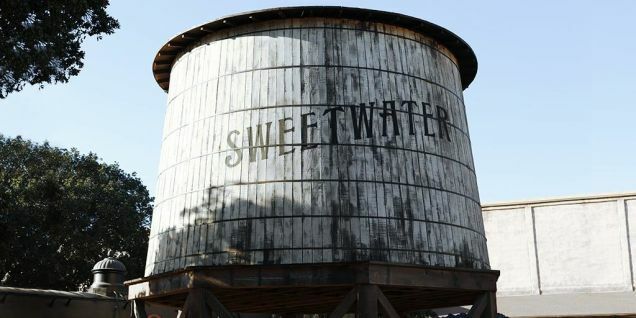 We can assume ‘Sweetwater’ will be the official title of the town of Westworld, given that there are multiple “amusement parks” inside of Elos (the name in the original Michael Chrichton film). Westworld becomes HBO’s second drama from Warner Bros. Television, joining Damon Lindelof’s adaptation of The Leftovers. The series will air just in time as HBO has already said goodbye to its ratings darling True Blood, as well as recently wrapping up of Boardwalk Empire and Aaron Sorkin’s The Newsroom. Westworld joins a drama roster that also includes Game of Thrones, True Detective and Utopia.